Ribollita has been around for a while, but it’s always been the place I just walked by and said I’d try someday. Finally, that someday came and my other half made a Saturday night reservation at the Italian food purveyor. When we walked into the restaurant the entrance left us standing next to a couple tables in a long, thin path that led to a larger section of the dining room. After waiting a couple of minutes, someone took us to our seats. The walk led us through and past a couple small sections of tables to a table by a window. The first order of business, even before sitting down, was heading to the rest room. I didn’t need to rest, but when I entered I found that it would be a perfect place to do that. The relatively long, very thin bathroom sort of resembled the shape of an extra-long twin mattress. It might have actually been a little longer and slightly thinner than that though. I laughed as it was definitely the only bathroom I ever remembered seeing in that extreme of a shape. I’ve seen very small lavatories, but never quite with those dimensions. On the walk back to my seat, I continued to squeeze my shoulders in front of me to save space. The dining areas were tightly packed with tables. If I had a wider build I might have found it cramped, but I actually thought it was somewhat cozy. I considered cuddling with the woman sitting at the table next to me but I figured she might find it awkward. After ruling out a quick loving moment with a stranger in public, we looked at our menu briefly before a waitress approached us with specials and offered to take our drink orders. We needed a minute more to decide. When she returned, we asked a couple questions about the drink menu and made our decisions. I chose the Geary’s Autumn Ale and she got a full-bodied white recommend by our server. We tried to order an appetizer but the waitress suggested we wait and order with our meal since she said the apps come out very quickly. Upon the return of our waitress, we placed our orders. The Polenta Crusted Calamari was our appetizer to share. I set my heart on the North End Linguine as an entree. There were four seafood options with it from which I was told I could choose one or all. I chose all four – scallops, clams, mussels, and calamari. I also decided on the white sauce over the red. My wife went with the Butternut Squash Ravioli with Brown Butter Sage Sauce which was one of the specials. She ordered a side of the spinach which was the recommended pairing for the ravioli according to our server. Our beverages showed up shortly after our order was placed along with some bread and oil for dipping. We responded to the “do you want some fresh pepper in your oil” query in the affirmative and received some cracked corns in our dipping bowl – not that I cared. We were both happy with our drink choices. After our first sips, we tried the bread which was slightly herbed and very delicious. Somewhere in the process of chomping on bread and downing our drinks, I tried to take in a bit of the view. There wasn’t an excessive amount of décor, but right next to me was a pumpkin and a stone rooster on the windowsill. I couldn’t figure out the purpose of the rooster. I found it to be quite an interesting decoration for an Italian restaurant. I googled Italian rooster and found some similar ones, so I’ll assume it’s some sort of traditional decoration. I think it’s a safe bet the pumpkin was there purely as a seasonal piece. Keeping with the promise of the quickly-served app, our calamari came out in a flash and distracted me from my rooster pondering. It was served with a substantial portion of Cherry Pepper Aioli. I tried it. I’m not generally a fan of polenta so my thoughts on the outer coating were pretty neutral. Other than that, the squid was very good – crunchy outside and tender inside. The aioli was really nicely done with a touch of spice, creamy texture, and a bit of sweetness. We munched on the calamari until it disappeared like it was the center of a David Blaine illusion. Then we waited a little while for our main course. When our meals came out I was already drooling due to the smells flowing through the restaurant. My wife’s ravioli was relatively nondescript save for a little seasoning and green garnish. Mine was chock full of seafood, most notably mussels, as they were in the shell. I was intrigued by the white sauce which was not a cream sauce as I expected, but more of a broth. I took a bite. It was flavorful with substantial garlic and a nice seasoning combination. The linguine was a perfect al dente. My wife tried hers and loved it. I took a couple more bites of my food and was intrigued by the ravioli which my wife liked so much. I stabbed half a piece with my fork and filed it between my lips. It was super-duper. The sweet butternut squash filling and the rich, but not heavy, brown butter sage sauce was really a winner. I went back to eating my meal wishing I could order a second and add the raviolis to my linguine. As my wife neared the end of her ravioli plate, she offered me the last one. I ate it then finished my meal. When I was done with my pasta, there was still a small pile of garlic and seasoning left on my plate. I forked the delicious hill of yum into my mouth and realized I felt like a stuffed tomato. I wasn’t quite ready to explode but I was pretty sure I had gained a sizeable amount of heft since I arrived. We passed on dessert even after hearing the awesome choices which were all made in-house. Our meal came to $78 including tip. We were happy with the experience. My meal was very good, but my wife’s was so good that I almost wished I had ordered hers. Ribollita isn’t going away any time soon. Their food is solid, the service is top notch, and the cozy atmosphere is warm and inviting. Except for the fact that a tight squeeze on the way out almost caused me to drag the table cloth with me, the atmosphere, ambiance, and overall experience were at a level that makes it clear why Ribollita is so busy to this day. Like the Terminator, I’ll be back. 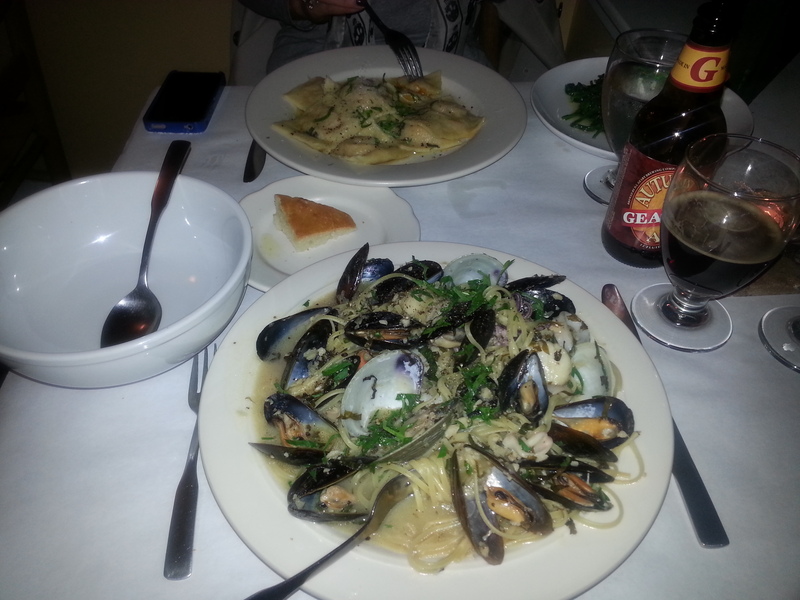 This entry was posted in Portland, ME food on November 7, 2013 by peterpeterportlandeater.